Twenty-year-old school teacher Francine Baron of Grand Bay stole the spotlight on Friday night by capturing the Miss Photogenic, Best Talent, Best in Costume and Swimwear and Best in Question and Answer awards on her way to winning the prestigious Miss Dominica pageant. In the talent round she sang Whitney Huston's "I look to you" as her melodious voice echoed through the speakers at the Windsor Park Stadium to the thunderous applause of the crowd. She stated that many people look to "someone" or "something" for inspiration, guidance and support but she turns to God. In the costume round, Francine paid tribute to the late South African president Nelson Mandela in a piece called "Viva Madiba"; Miss Baron said Mandela waged a victorious fight against apartheid and racial discrimination in South Africa and the world. Her costume depicted the South Africa and African National Congress (ANC) flags, their colours and meaning set in the context of the rich culture and tradition of the Zulu people. It was designed and built by Creative Dynamix under the leadership of Pat Fontaine. "It feels so exciting that the months turned into days and the days into hours. I am finally sitting here on this chair, my hard work has paid off. I feel relieved," the newly crowned Queen told reporters. "I can sleep well. It was exciting, it has been extremely difficulty. I had to make some last minute changes to my original dress but in the end, it all paid off." Then she thanked the people of Grand Bay who came to the show in large numbers to support her. "I want to tell Grand Bay that I love them very much. This all proves that we have people in that community who can reach the highest achievement," she said. "I am ready to represent Dominica to the best of my ability. Whatever will take me to my highest achievements, I am prepared and ready for it." She revealed that has had been day-dreaming about the Miss Dominica competition for many years and started working on her talent two years ago. "I had my talent since 2012 but felt I was not ready and prepared and so waited for my time," she said. "It shows that being prepared does make a great difference. I was very prepared for the questions and I am proud of myself knowing that I did my very best and handled it well." Her father, Franklyn Baron, a former school teacher and current employee of First Domestic Insurance described the crowning of his daughter as "a great joy." "I always knew that she had what it takes to make it happen; she is a very intelligent girl. She won in almost every round and I am extremely elated," he said. Donnella Riviere was the First Runner-up; Octavia Prosper was the second. In the talent round Prosper depicted, in poetry and dance, the plight of the Crapaud, a Dominica's national dish until the large frog was threatened with extinction; while Riviere paid tribute in dance to three of Dominica's culture icons- Raymond Lawrence, the retired Chief Cultural Officer and founder of the 47-year-old Waitukubuli Dance Theatre Company, Lucia Lander and Daryl Phillip. 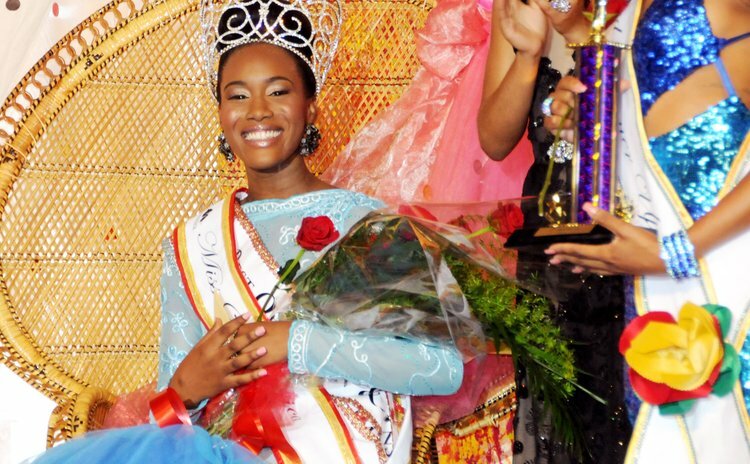 Seven young ladies participated in the 2014 Miss Dominica pageant.